More than cruises! Advice you can trust. The best choice and prices. 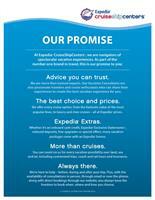 Expedia Extras. Always there. Call, click or drop in today for travel services from a friendly local expert. Located in Wilburton Shopping Center across the parking lot from Uwajimaya and Total Wine & More.